Last week I shared a post on time, and this week I would like to follow it up with something I started back in late 2011 or early 2012. As a quick reminder, we all get a daily deposit of 86,400 seconds a day to spend and invest however we choose. It doesn’t matter who you are or where you come from, you get the same exact deposit. You can’t buy more time. Once you use it, you lose it. Any unused balance is deleted from the ledger and the balance reset. There is no guarantee tomorrows deposit will come. Memento mori (Latin ‘remember (that you have) to die’), or also memento mortis, “remember death,” is the Latin medieval designation of the theory and practice of the reflection on mortality, especially as a means of considering the vanity of earthly life and the transient nature of all earthly goods and pursuits. A few years ago I found a blog post from a former Special Forces vet that was talking about his Memento Mori Chart. He explained it as a grid that was 52 columns by 80 rows, with each row representing 52 weeks in a year. This was his way of making sure he didn’t take time for granted and a tool to put him back on course if he lost perspective. Why 80 rows? For him, 80 years seemed like a reasonable age to live to and was close to the average lifespan. So every Sunday he would mark a box and reflect on the week that passed by asking himself questions. Did I spend my time wisely? Is there anything I would have done differently? These and other questions would keep him grounded and living life to the fullest. Intrigued? I was, so I started my own Memento Mori Chart. Being the Finance geek that I am, I created my chart in Excel and added a few extras. The most notable changes that I made to the chart are the time stats to the right that break down the time I have been alive into years, months, weeks, days, hours, and seconds. I also added in a graphic related to health and fitness, because when I found this chart I had just embarked on a journey to get back in shape. I had found myself 50 lbs. overweight since graduating college. Soon I will be updating it with Vitality, Connection, & Contribution. What you can’t see is that my chart is actually 52 x 100. This is because I would like to live to 100 years old, which I don’t think is beyond the realm of possibilities in today’s day and age. Obviously, there is no guarantee, but this is how I have chosen to set my chart up. Did I spend time with the people I love? Did I waste any time worrying about stuff that doesn’t matter? Did I do things that made me happy? Is there anything I spent time on that I need to change? Some weeks I reflect back and realize I wasted time on trivial issues. But most weeks I feel good about the way I spent and invested my time. I know it may seem a bit morbid to keep track of your life like this. But it can also be liberating. Once you realize how little time you have on this earth, you appreciate time much more. You find the motivation to make changes in your life before it’s too late. If anyone is interested in a copy of the chart I have created in Excel, click the “Download Now” link below. Great post with an interesting take on what I call “R.O.T”. To me, return on time is quantitative and qualitative because you can measure it so many ways and with your own weights depending on what you value. Could you send me your excel file? I’d be interested in taking a look at it. I will send you the excel file to your email you listed when you left a comment. I like the idea of this as well, I’ve started doing a weekly review of goals & have found that it’s helped me to get really clear and clarify what is important and consciously review my time throughout the week ..
Would you mind sending the file too? I know the horse may certainly have bolted haha; hope all is well too! Hey Jef, Just sent you an email with the Momento Mori template attached. great idea; can i get a copy of the template? thank you. Can you please send me a copy of your Momento Mori Excel File. Just found your website. I think it’s great. Could you send me the excel file? Thanks, Ryan! I will send you the file via email now. A great way to remind yourself how precious everything is. I’m considering getting a tattoo that is related to memento mori and a copy of this template will also serve me well. If you could please send me the excel file I would be very grateful. Was worried I was late to the party, but I see you still check on this one from time to time. Would you mind sending the file to me. Thanks for putting in the leg-work!! Andrew – never late to the party as long as this blog exists. I will email you the tracking sheet. 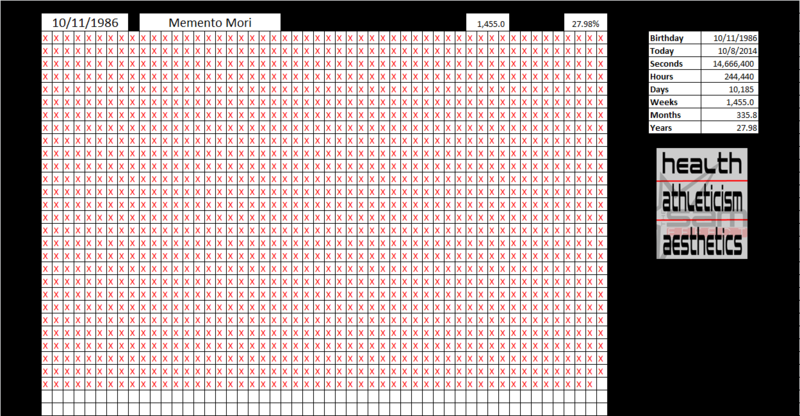 I’ve kept track of my Memento Mori chart for some years but love your template. Would you email to me, please? Thanks! Hi, I like the idea and thanks for the offer. Please send me this if you get time. Hi, i really want to try this out. Would you be kind to send me a mail with the template?